A bathroom should be a pleasant room, both comfortable and stylish. If your client has a bathroom in need of some revamping, stop by and chat with our design experts at ProSource® of South Indianapolis. From step one to the final product purchase, we can help you find exactly what you need to enhance any bathroom. We can work with you to make the most of a small space or to upgrade a larger space with some luxury items. 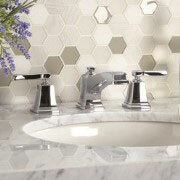 Come talk to us today about your upcoming bathroom remodel and shop name brands at wholesale pricing. 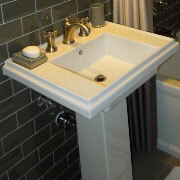 Talk to our design experts about how a bathroom sink can enhance the design of your client’s bathroom. Choose a bold, slab style sink for a modern look. Opt for a traditional basin to create a classic feel. Whatever design and budget you are working with, we offer bathroom sinks to meet your needs. From simple faucets with a sleek design to ornate bathroom sink faucets that add extra flair, we carry quality faucets at great prices. Browse our extensive selection to create the perfect finishing touch. A shower can be as simple as a single head or as luxurious as a jetted wall. Whatever type of shower your client needs, we can help pick the right style and size for their unique taste. Want to take your client’s sink space and turn it into something more? 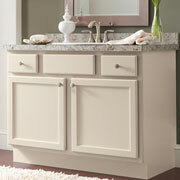 Be inspired as you browse our vanity selection, offering extra storage and added class to any bathroom remodel. Turn a bathroom into a classic oasis with the right tub. 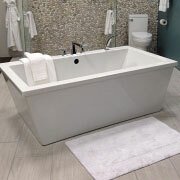 From large jacuzzies made for long soaks to simple and economical tubs, we carry top brands at wholesale pricing you’ll love. Never neglect even the most functional elements of a bathroom remodel. 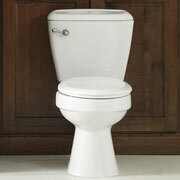 We carry the latest in toilets, including stunning styles and efficient operation.